Best of all, Persuasion features an intelligent, interesting heroine in Anne Elliot whose diffidence – like that of Fanny Price in Mansfield Park – creates compositional challenges for Austen by putting at the center of the novel a character who does not naturally command the center of the stage, and drive the plot, the way Elizabeth Bennet, Elinor Dashwood, and Emma Woodhouse all do, in their very different ways. And then, at what should have been the middle of the novel, Persuasion slams into two enormous blocks of exposition, comes to a dead stop, and ends. Exposition is an important tool for novelists and Austen knows how to use it, often at the beginning of a novel, where she is establishing the premise, and at the end, where she is tidying up loose ends and letting us know what happens to the characters after the major action is over. The problem with the exposition is Persuasion is that it doesn’t supplement the action of the story. Instead, the exposition replaces the action of the story. In the first instance, Austen dismisses the charming scoundrel through an endless discussion between Anne Elliot and an invalid friend, to whom the scoundrel just happened to have confessed every insulting opinion he ever held toward Anne’s family while he was also busy driving her friend’s husband to bankruptcy and early death. So informed of the scoundrel’s scoundrelness, Anne Elliot drops him from her thoughts, and his role in the novel is done. In the second instance, soon after the first, Austen contrives to have Anne Elliot overheard in a conversation about love by the problematic Mr. Right, who immediately sends a letter explaining himself, and re-proposing marriage, which Anne accepts, and which pretty much brings the novel to a close. It was hard for me to think that a writer with Austen’s talent and experience could suddenly turn into such a duffer halfway through a book. Then my wife reminded me that Persuasion was published after Austen’s death. Austen began writing Persuasion in late 1815 and completed it in August 1816. In early 1816, she fell ill with a disease which progressively weakened her until she died in July 1817. Someone with a better knowledge of Jane Austen’s life than me will have to say whether we can know if Austen felt she was racing death in 1816, although it is a pleasingly theatrical idea. But we do know she was feeling the effects of poor health, which I think is a good explanation for the problems in Persuasion. I also find it a moving one. All novels are deeply personal documents, even when the novelist reveals little or nothing about herself in the work, because of the intensity of energy required to write them. That Persuasion was flawed by the final drama of Austen’s life gives the ending a power the words themselves don’t quite achieve. Good thoughts on Persuasion, Peter. I’ve been re-reading Jane Austen, too. Emma continues my favorite. It’s hard to choose. I like Emma, in particular, because every character gets wrong with whom every other character is in love. It’s not just Emma that’s mistaken. They all are. And yet it ends happy, which is an encouraging thought. I agree that Persuasion is uneven, but it’s still my favorite. I’m a sucker for the fairy tale side of the story (long suffering, loyal girl gets her true love.) I totally see what you mean about the Anne/Ms. Smith section, and I wonder if she had more time if that wouldn’t have been rewritten and refined. Nice blog. Thanks for raising such interesting points. I agree. 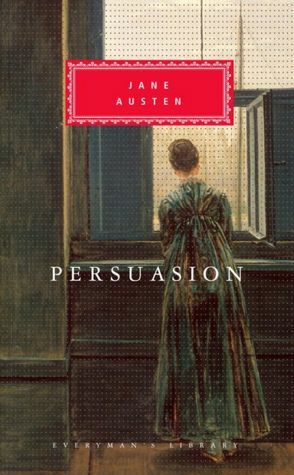 I think “Persuasion” would have been better if Austen’s health was better. And there is nothing wrong with the fairy-tale aspect of Austen. If you squint, you can see genre formulas deep inside many of the classics. “Hamlet” is a revenge play in origin (“Claudius. You kill my father. Big mistake.”) although it became a whole lot more in Shakespeare’s hands.